My daughter turned 11 yesterday. Her very excellent day included the evening session of a three-day Aikido seminar sponsored by a local Brooklyn Dojo. It got me to thinking about how supportive these types of events are. In the Aikido world, master teachers train participants in new techniques, general practice concepts and offer opportunities for augmenting learning, including special sessions for kids. 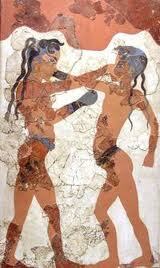 A women’s boxing seminar might work equally as well, perhaps beginning with a half-day event. I know that there are fantasy camps around, but in the seminar concept, a gym facility could be borrowed on a Sunday and trainers as well as experienced boxers could lead participants in a variety of drills, boxing techniques, boxing exercises and sparring. An hour or two could also be devoted to kids and/or invite girls of 11 or 12 on up to participate in the day’s activities. The seminar would have to be self-funded in order to pay for facilities and trainers, but with enough interest and a reasonable fee it might well work out. 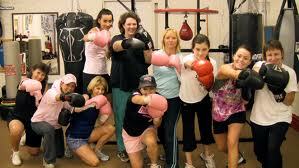 It’s also an especially nice way for women boxers both novice and experienced to feel as if they are part of a larger community. I know that in boxing in particular, training is often one-on-one and the relationship between the boxer and her trainer is sacrosanct. The seminar or clinic concept can augment that relationship by teaching new ways of thinking about the sport and providing a supportive atmosphere for trying out new techniques, not to mention the chance to meet up with old friends and a place to make new ones. Please contact me if there is any interest out there in planning and/or sponsoring such an event. With the Olympics looming on the horizon in 2012, now might be a great time to start thinking about these kinds of sports clinics if nothing else than to build momentum and a fan base. ***P. S. How’s this for timing! It seems that Gleason’s Gym in Brooklyn, NY will be sponsoring an All Female Boxing Clinic and Show on April 21, 22 and 23, 2011!